Jim Isherwood was first admitted to Billinge Hospital on Friday 2nd August 1974, to “dry out” and before he left his home on Wigan Lane to start treatment, he downed half a tumbler of whisky and several tablets. So began a seven months’ stay in Billinge, where, without the booze, he began to see life in real terms once again. Before being admitted, he sat in a side room and a nurse gave him a bowl of apple pie and custard. He soon found being looked after an appealing pleasure. At Billinge Hospital, he was allowed to set up a painting class which was attended by other patients. Often he sat and painted alone. But in the first weeks, he didn’t handle a paint brush at all. Then slowly and tentatively he began to create little watercolours in black and white. Then he moved to colour and some of these works of art have a “B” against his signature, indicating they were done in Billinge Hospital. He was, he said, nervous thinking that he may never paint again. He needn’t have worried. Within three months he was painting in oils – some postcard sized works of art of his Wigan figures. Then large works of flowers. On occasions, he found his “pupils” frustrating. There were disagreements and one took revenge by putting sugar in Isherwood’s bed. Throughout these months, he was seen by the hospital psychiatrist who praised him for being able to keep off the drink. Instead the artist knocked back the soft drink “Irn Bru” which he bought from the newsagent’s shop opposite the hospital gates. The painting class flourished and some works by patients were exhibited in the ward. As Christmas approached, Jim Isherwood began to paint robins on small calendars – and these he either sold or gave away. They are now rare collectors’ pieces. 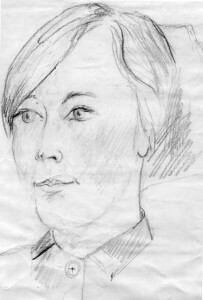 One of the nurses, Teresa Dickinson (now Mrs Boland) who now lives in Bournemouth, tells how she and others were sitting in the art room. She asked the artist to draw her. At first he refused, but other patients ribbed him a little and he complied, but not doing the drawing with good grace. When he undertook the drawing – pictured here left – Isherwood was still being persuaded to become involved in an arts project. 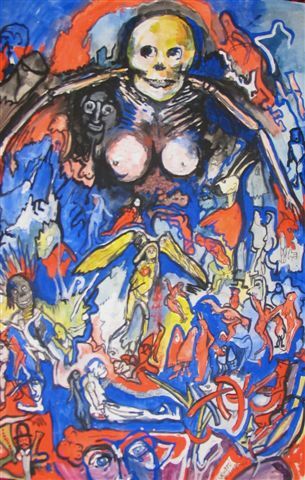 One of the most amazing paintings Isherwood completed during his stay was a large watercolour entitled “That’s Life” – pictured top – which is not for the faint hearted. There are many of Isherwood’s thoughts around that time in this image – this work of art has remained in private hands since it was done all those years ago.